Replacement | Do You Need New Tires? Low Tire Tread – this a tell-tale sign that you need tire replacement. An easy way to check tread depth yourself is to place a penny, with Lincoln’s head upside down, into one of the tread grooves. If all of Lincoln’s head is exposed, your tread depth is less than 2/32 inch and you need new tires. Cracks in the Rubber – keeping your tires properly inflated and regularly in use will help prevent rubber cracks. If you notice cracks that appear deep in the rubber, you should have them inspected and replaced if necessary. Blisters and Bubbles – signaling severe inner lining damage on a tire, this problem should be taken seriously. Often caused by an impact of some sort, like hitting a curb or being in an accident; your tires likely need to be replaced immediately. Steering Wheel Vibrations – vibrations in your steering-wheel or driver’s seat/floor board is typically a sign that you need to have your tires serviced. If the problem persists after having the tires rotated or balanced, you may need new tires. Make your investment last longer by properly caring for your tires. Tire maintenance includes rotation, balancing, and alignment; all of which help make your tires last longer and keep your vehicle safe. Check your owner’s manual to learn what the most ideal maintenance routine is for your vehicle. Typically, you should have your tires serviced at the same time you’re getting an oil change. Below is general information to help you care better for your tires. Rotating your tires regularly is an important auto maintenance task. Your mechanic will rotate the back tires forward, and the front tires back. This helps your tires wear more evenly; prolonging their life and saving you money. 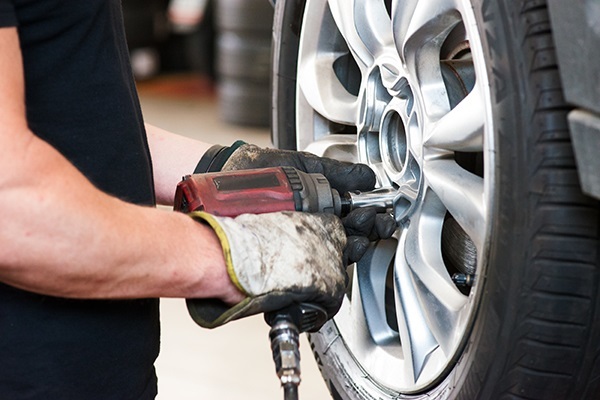 Tire rotation is recommended every 6,000 – 8,000 miles or 6 months. Properly balanced wheels will reduce tire wear and make for a smoother ride. A common indicator of unbalanced tires is a vibrating steering-wheel or driver’s seat while at high speeds. Every 3,000 – 6,000 miles, you’re tires and wheels need to be removed, measured, and any imbalances corrected. Your alignment can be thrown off by hitting pot holes or curbs. A wheel alignment is actually the adjustment of your suspension system that aligns the wheels with each other and the road surface for optimal drivability. You should have your wheel alignment checked every 6,000 miles and adjusted if necessary. Dave’s Muffler can handle all of your tire related service needs. If you have a flat and need roadside assistance or a tow, give us a call and we’ll be there! Maybe you have a tire that constantly leaks and needs to be replaced, or are ready to switch to winter tires. 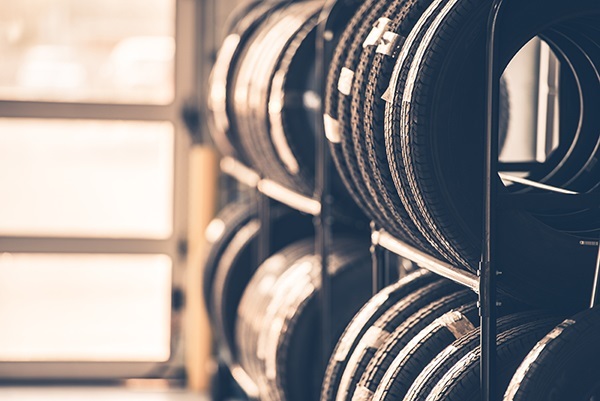 Whether you’re looking for the best price on new tires or simply need tire maintenance, our Kenosha Tire Shop is the best choice! Contact us today to schedule an appointment at our Kenosha auto shop.